The uncle of four children who died in a house fire wants them to be "buried together side-by-side" and hopes they get the "funeral they deserve". 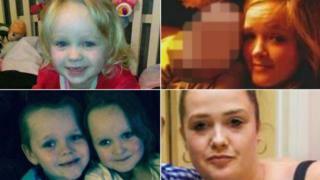 Demi Pearson, 14, Brandon, eight, Lacie, seven, and three-year-old Lia died following the blaze in Walkden, Salford on Monday. Their mother Michelle Pearson, 35, remains in a drug-induced coma. Matt Pearson, who is the brother of Ms Pearson, has started a fundraising appeal to help with funeral costs. He said: "I want to give these kids the best funeral they deserve with customized coffins for them." He added Lia loved Peppa Pig and "it would be nice to get her this coffin" as well as a horse and carriage to take the siblings to the cemetery. Mr Pearson added: "They will all be buried together side-by-side." The appeal has already raised more than £11,500. Two men and a woman appeared in court on Friday charged with murdering the siblings. David Worrall, 25, of no fixed address, has been charged with four murders, arson with intent to endanger life and attempted murder. Zak Bolland, 23, and Courtney Brierley, 20, both of Worsley, also face the same charges.